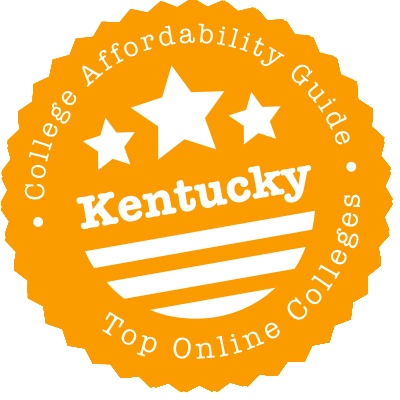 Scroll down to see the top not-for-profit colleges and universities in Kentucky offering online degree programs. University of the Cumberlands maintains roughly 30 online programs from the associate to the doctoral level. A quarter of these are education programs covering teaching and administrative leadership. Business students are also provided for, with an Associate of Science in Business Administration leading to a BSBA, then an MBA, and ultimately a PhD in Leadership. The remaining programs may appeal to future and current nurses, psychologists, ministers, human services professionals and counselors. Not to be excluded are aspiring law enforcement pros - the school's MS in Justice Administration ranked eleventh on U.S. News and World Report's 2017 list of best online graduate criminal justice programs. Eastern Kentucky University ranked as a Best Online Program in five different categories in the 2017 U.S. News listings. The university was cited for its online bachelor's degrees, graduate education, and graduate nursing programs and was also honored as a best online bachelor's program and graduate nursing program for veterans. EKU has about two dozen programs for online students, including everything from occupational therapy to fire, arson, and explosion investigation. Teachers can earn a graduate degree or prepare for endorsements online, and nurses can earn degrees from bachelor's completion through a Doctor of Nursing Practice. EKU's online programs offer multiple start dates, eight-week terms, and asynchronous classes for maximum flexibility with no need to come to the campus. Western Kentucky University offers over 1,700 online classes and more than 80 online degree programs. Online associate degrees are available in early childhood education and interdisciplinary studies. Online bachelor's degrees are available in three formats: 100 percent online degrees, 2+2 bachelor degree completion programs, and flexible degrees, which are offered 80 percent online. Online bachelor's degrees offered 100 percent online include degrees in criminology, family and consumer sciences with concentrations in child studies or family studies, health care administration, interdisciplinary studies, organizational leadership, sociology and computer information technology. Online bachelor's degree completion programs (known as 2+2 programs) are available in computer information technology, dental hygiene, management with a concentration in business administration, nursing, systems management and technology management. Online master's degree programs are available in more than 20 subjects, including criminology, history, mathematics, organizational leadership, social responsibility and sustainable communities, adult education, business administration, health administration, public health, athletic administration, nursing, library media education, special education, early childhood education, secondary education, communication disorders and biology. Additionally, WKU offers over 25 online graduate certificates and endorsements and 15 online undergraduate certificates. Online students at Western Kentucky University are eligible for financial aid, including scholarships, grants and loans. Jefferson Community & Technical College is a member of the Kentucky Community College System, which gives students the ability to enroll in online courses offered by any of the 16 member colleges around Kentucky. That gives students the ability to select from hundreds of different course offerings to get the courses they need. Online students can choose from two approaches to learning: Learn by Term or Learn on Demand. Learn by Term uses the traditional semester format and students complete their courses on the same schedule as others enrolled in the same class. Learn on Demand allows students to work at their own pace, completing courses in as few as six weeks, and decide when to start the course. Online programs at Somerset Community College are available in five areas of study. Visual communication programs cover digital design and web design. The medical information technology program has diplomas and certificates in eight specialties. The business administration systems program has an Associate of Applied Science with four tracks plus a variety of diplomas and certificates. The computer and information technologies program has an associate degree with four tracks and also has nearly 20 certificates. The criminal justice program results in an associate degree, and the college has transfer partnerships with four universities. Somerset is also a member of the Kentucky Virtual Campus, giving students access to online classes from other community and technical colleges. Students at Morehead State University can complete a bachelor's degree or earn a graduate degree through online classwork. Eight degree-completion programs are available for students who already have an associate degree, including RN to BSN, several business degrees, and two technology programs. Online graduate programs include several in the field of education, such as a Doctor of Education and an Education Specialist in Adult and Higher Education. Master of Arts programs include counseling, English, and sport management. MBA, public administration, and nursing degrees are also offered online. Morehead State ranked No. 39 as Best Value School in the South, according to the 2018 rankings by U.S. News. Northern Kentucky University recently added accelerated options to two online degrees. In the accelerated programs, courses run for a shorter duration - five weeks for the MBA, seven weeks for the RN to BSN - and sessions are scheduled year round. The rest of NKU's online programs follow a more traditional academic calendar. At the undergraduate level, online programs include Bachelor of Science in Business Administration with four majors. The university has online bachelor's and master's in health science, and a Master of Science in Health Informatics. Nurses can earn a Doctor of Nursing Practice. NKU was ranked No. 27 in Top Public Schools among regional universities in the South in the 2018 U.S. News rankings. The University of Louisville offers five online bachelor's degrees and eight online master's degrees. Online bachelor's degrees include a B.S. in Leadership and Learning, a B.S. in Criminal Justice, a B.A. in Communication, a B.S. in Communication and an R.N. to B.S.N. program. Online master's degrees include an M.S. in Criminal Justice, an M.S. in Social Work, an M.S. in Human Resources and Organization Development, a Master of Engineering in Engineering Management, an M.S. in Civil Engineering, an M.S. in Computer Science, an M.A. in Higher Education Administration and a Master of Education in Special Education. Additionally, the University offers online graduate certificates in autism and applied behavior analysis, data mining, and network and information security, as well as teaching endorsements in classroom reading and instructional technology. Online bachelor's degrees at the University are degree completion programs designed for students who have already completed their general education requirements, either online through the Kentucky Community and Technical College System (KCTCS) or at another institution. Students entering online graduate programs can transfer up to six graduate credits into their program, and students in the organizational leadership and learning bachelor's program and the criminal justice master's program can receive credit for previous work experience or training. Online students at the University of Louisville are eligible for financial aid, including federal aid, state aid and institutional scholarships. Murray State University offers several online programs at the undergraduate and graduate level that can be completed entirely online. Online undergraduate programs are available in seven subject areas, including business administration, computer information systems, integrated studies, logistics and supply chain management, nursing, and telecommunication systems management. Online graduate degrees are available in 11 subject areas, including agriculture, business administration, human development and leadership, information systems, library media, non-profit leadership, organizational communication, public administration, teaching English to speakers of other languages and telecommunications systems management. MSU also offers online master's and post-master's programs in nursing specialties such as academic nurse educator studies and clinical nurse specialist studies, as well as a Doctor of Nursing Practice degree. Additionally, online certificates are available in human development and leadership, professional writing and non-profit leadership studies, as are online endorsements in ESL, gifted and talented education, and instructional computer technology. Online courses at MSU are delivered in an asynchronous format with no face-to-face interaction. Students enrolled in online programs are eligible for the same types of financial aid as on-campus students and have access to student support services such as online textbook ordering, virtual library access and interlibrary loan. Online courses from Elizabethtown are listed at the Kentucky Community & Technical College System (KCTCS) website. All KCTCS Online courses transfer to the Elizabethtown campus, and enrollees at any college can take courses at any other. Plus, KCTCS courses are designed to transfer to one of Kentucky's eight four-year universities. Due to its proximity to Fort Knox, Elizabethtown Community and Technical College also facilitates Army 101 and Army HR102 classes for students contemplating military service. For all classes, Elizabethtown enrollees can take proctored exams at four sites across the state. The University of Kentucky offers several fully online and hybrid degree programs. Fully online programs include master's degrees in library and information science, rehabilitation counseling, manufacturing systems engineering and arts administration. A fully online graduate certificate in distance education is also available. Hybrid degree programs include a bachelor's degree in health science with a concentration in clinical leadership management, master's degrees in education, music education, physician assistant studies and social work, and doctoral degrees in education, educational policy studies, rehabilitation sciences, physical therapy and nursing practice. Additionally, a hybrid certificate program is available in interdisciplinary early childhood education, along with supervisor and superintendent certifications. Hybrid programs vary in their on-campus requirements. Some programs, like the Master of Education, include classes that combine on-campus and in-person learning, while others, like the Master of Music in Music Education, include completely online classes in the fall and spring semesters and on-campus classes during the summer. Online students enrolled in a degree program at the University of Kentucky are eligible for financial aid. Big Sandy Community and Technical College has an assortment of associate degree and certificate programs students can complete online. Many options, such as technical studies and business administration, provide students with the skills needed to enter the workforce as soon as they finish the associate degree. Big Sandy also has online transfer associate degrees for students who want to get a head start on their studies before transferring to a four-year school. Depending upon the pathway they choose, students may be able to transfer to schools such as the University of Louisville or Eastern Kentucky University. In 2017, Big Sandy was named one of the nation's top 150 community colleges by the Aspen Institute, which awards The Aspen Prize for Community College Excellence. Gateway Community & Technical College has an online program called 2/8/2 that allows students to earn an Associate of Arts or Associate of Science degree in two years by taking two classes every eight weeks. These associate degrees are for students who want to transfer to a four-year school to earn a bachelor's degree. Associate degree students complete at least 60 credits and get most of their general studies requirements checked off before transferring. Gateway has agreements that guarantee credits will transfer to schools including the University of Kentucky, Northern Kentucky University, and Morehead State. All online students meet with an adviser to plan out their pathway to graduation. Hazard Community and Technical College has two options for online learning. Learn by Term is a traditional online learning program that follows the school's semester calendar and presents regular, full-credit classes. The Learn on Demand program lets students choose the start date for their classes, and some full-credit classes are broken into smaller bits, called modules, that last from three to eight weeks. Students can take modules that fit their schedule and they must take all the modules to earn credit for the class. Learn on Demand programs include transfer associate degrees and programs in business systems and computer technology. Learn by Term programs include all those subjects plus criminal justice, medical information technology, and early childhood education. Maysville Community and Technical College offers about two dozen certificates and a couple of degrees through online coursework. Most of the certificates cover topics in business or technology. For example, online students can gain skills in payroll accounting, team leadership, or medical coding. Licensed practical nurses can move up to registered nurse status through MCTC's online LPN to RN program. While classes are delivered online, nursing students must come to campus about every other week for clinicals and labs. The medical information technology degree is 100 percent online, with no need to come to campus. Students can choose from six tracks, including electronic medical records, medical transcription, and medical administration. All online courses offered by Midway University are delivered in an accelerated eight-week format, and students can enter programs at five points during the year. The university offers associate, bachelor's, and master's degrees online and has an online program so students can complete all the general education requirements for any undergraduate major. Bachelor's degrees available online include business administration with an accounting concentration, criminal justice, health care administration, interdisciplinary studies, marketing communications with a concentration in graphic design or writing, psychology with a possible concentration in alcohol and drug abuse counseling, and sport management. Undergrads can also enter a variety of programs in the field of education. Some of the education degrees lead to certification to teach elementary, middle, or secondary school, but students can also enter a non-certification program. Online MBA students can choose to specialize in equine studies, health care administration, sport management, or tourism and event management. Nurses can complete their Bachelor of Science in Nursing or earn a Master of Nursing with a track in nursing administration or nursing education. Midway also has an online Master of Education program. The online programs offered by Ashland Community and Technical College have a technology focus, and students can earn an associate degree in computers and information technology completely online without ever having to go to campus. The program delivers classes in eight-week terms, with two terms per semester. That timetable allows students to complete several courses per semester and speed the time to graduation. The college also offers more than a dozen certificates for students who want to gain job skills, and many of the certificates are embedded into the degree program or have credits that can be transferred to a degree program. Many of the certificates prepare students for recognized technology certifications, such as CompTIA Security+ or A+. Owensboro Community and Technical College provides online classes through the Kentucky Virtual Campus (KVC), a network of state schools. KVC offers programs leading to associate degrees for transfer and Associate of Applied Sciences degrees, intended for students seeking career skills over a head-start on a bachelor's degree. Students who follow the Kentucky Transfer Framework while working on a transfer degree can be assured the 60 credits will transfer to any state school. Some KVC courses have an accelerated format, allowing students to complete their degree at a faster pace. Asbury University offers four online bachelor's programs that are set up as degree-completion programs. Students may transfer in as many as 75 credits, and they must have at least 12 college credits to apply. Asbury also offers an online Associate of Science program that students may complete before transferring to one of the bachelor's programs. The coursework for these programs is mostly delivered in an asynchronous format that allows students to access course materials at their convenience as long as they meet deadlines, but students are also expected to participate in some "live" events where they must be at their computer at a set time. Online programs led to a Bachelor of Science in Organizational Management, Bachelor of Science in Leadership and Ministry, Bachelor of Science in Instructional Design, and Bachelor of Science in Elementary Education. The elementary education program is a teacher certification program that requires students to complete clinical hours in a Kentucky school, so students are typically Kentucky residents or students who live close enough to Kentucky to commute to their assigned student teaching location in Kentucky. Georgetown College's graduate education programs rank No. 66 out of 192 programs in the United States, according to U.S. News and World Report's 2016 listing of best online graduate education programs. Georgetown's graduate education programs - some designed for certified teachers and others for applicants who want to acquire a teaching license - are all offered in a 100 percent online or blended format featuring seven-week courses. Programs for certified teachers include master's programs in which a student can earn school principal certification, become a teacher leader, or gain certification in learning behavior disorders and/or moderate-severe disabilities. Teachers can also earn endorsements in English as a second language, literacy specialist, instructional computer technology, teacher leader, or gifted education, with or without earning a master's. Those seeking initial licensure can gain teacher certification with their master's and qualify to teach a variety of subjects, such as biology, chemistry, math, physics, art, French, German, Spanish, instrumental or vocal music, or special education. All the programs have a fully online option. Kentucky is reaching out to online learners! Websites like KYVC and KCTCS Online now make it easy to search for distance education programs. Public universities have lots of transfer options. Certain schools have stellar U.S. News & World Report online rankings. And tuition rates can be quite reasonable. In our short guide to choosing an online program to Kentucky, you’ll find info on—and links to—all these developments, plus a section on how to check for regional accreditation. Kentucky Virtual Campus (KYVC) is a handy online tool developed by Kentucky’s Council on Postsecondary Education. You can use this website to search for online degrees & courses offered by participating institutions, including Kentucky community & technical colleges, public universities, and private schools (e.g. Spalding University). KYVC also has answers to common FAQs, advice about online learning, tips on employee tuition reimbursement, and the like. Once you’ve decided on an online program, you’ll enroll through the home institution. Learn on Demand: 100% online degrees, courses, and certificates offered through flexible module-based courses or full 12-16 week courses. Programs include two-year degrees and short-term credentials, including career training. Courses start every week. Tuition is charged at a flat rate per credit hour. Learn by Term: Traditional, semester-long, online courses designed for students who can’t attend classes on campus due to scheduling conflicts, childcare, work, or other commitments. Programs include a variety of certificates & degrees, including degree completion programs with state universities. Credits are easily transferable. But wait, there’s a whole lot more! KCTCS is chock full of tips for high school students, military & veterans, and parents. There’s advice on transferring credits, earning credits for Prior Learning Assessment (PLA), getting workforce training—the list goes on. KCTCS also has transfer agreements with Kentucky public universities that make it easy to earn your associate’s degree online and transfer these credits to an online bachelor’s degree. If you’re considering out-of-state options, check out the Southern Regional Education Board (SREB) Electronic Campus. SREB has partnered with a number of schools all over the south to create an online program & course catalog. You can search for any degree program or a specific course. Programs that are marked “E” are offered at the Electronic Rate, which means the in-state and out-of-state tuition rates are the same. All of the Kentucky schools participating in the SREB catalog are public universities. These schools include Eastern Kentucky University, Morehead State University, Murray State University, Northern Kentucky University, the University of Louisville, and Western Kentucky University. The SREB also runs the Academic Common Market-Electronic Campus (ACM-EC), a program that allows students to pursue certain out-of-state college degrees through distance learning and only pay in-state tuition rates. A few caveats—approved ACM-EC programs have to be in one of the 15 participating SREB states. Also, you won’t be eligible for discount tuition rates if a public college or university in Kentucky already offers a degree program in your chosen field of study. To apply, you will need to meet the admissions requirements of the college or university that offers the program and be certified as a resident of Kentucky by an ACM coordinator. Visit the ACM-EC website for instructions. When it comes to Best Online Graduate Criminal Justice Programs, the University of Louisville (UofL), Western Kentucky University (WKU), and University of the Cumberlands frequently appear in the Top 20 programs. Kentucky rankings for Best Online Graduate Nursing Programs aren’t as strong, but Eastern Kentucky University (EKU) and Western Kentucky University (WKU) can often be found in the Top 30 programs nationwide. These Kentucky schools have the honor of appearing on both our “Top Online” and “Most Affordable” lists. That means they meet our rigorous criteria for quality, flexibility, price, and use of financial aid money. (You’ll see a CAG Score next to their profiles in our ranking.) If you like more than one, you can also compare their graduation rates and debt loads on College Scorecard. MSU’s website on Online Learning has details about its distance learning programs and courses, as well as info on online tuition rates. Undergraduate students in states near Kentucky (e.g. Alabama & Missouri) and those in certain counties in Tennessee, Illinois, and Indiana are eligible for in-state tuition rates. The Financial Aid Office has the scoop on grants and loans. Scholarships have their own section; transfer scholarships may be available to first-time transfer students. Considering the corporate life? MSU has a transfer agreement with KCTCS for its 100% online Bachelor of Science in Business. You can earn all your lower-level requirements for an Associate in Applied Science through KCTCS and complete your degree at MSU. UK Online is the central spot for UK’s online & hybrid degrees and courses, with links to each program’s website. The Registrar’s Office has more details about tuition & fees and the Office of Student Financial Aid (SFA) has info about scholarships, grants, and loans. According to the Registrar’s Office, undergraduates enrolled in online courses during the fall and spring semesters are charged the Kentucky resident rate; those enrolled in online courses during summer and winter are charged based on residency status. Graduate students in 100% online programs may be eligible for resident/in-state tuition rates as well. Check the program website. UofL Online Learning has a list of all its online programs, along with a comprehensive section on online tuition & financial aid. Tuition for online courses is the same for in-state and out-of-state students. Active-duty service members and certain members of the Reserve Component and Kentucky National Guard receive a substantial price reduction. Visit the section on Military for more on tuition discounts, veterans’ benefits, and credit transfers. UofL has a number of transfer agreements with KCTCS, including credit transfers for the online BA/BS in Communication, BS in Criminal Justice, BS in Organizational Leadership and Learning. Plus, if you attend KCTCS or Ivy Tech Community College in Sellersburg, Indiana, you may qualify for the KCTCS Academic Transfer Scholarship. Always check to see if a school with online programs is fully accredited by an organization recognized by the U.S. Department of Education. Although national accreditation applies to distance learning institutions, regional accreditation is the gold standard, especially if you’re thinking of transferring credits. The Southern Association of Colleges and Schools Commission on Colleges (SACSCOC) provides regional accreditation for degree-granting higher education institutions in Kentucky. The homepage allows you to search for accredited institutions by state. The page on Accreditation Actions will state if a Kentucky school has recently received a Warning or Probation because of quality concerns. Looking at schools outside of Kentucky? The Council for Higher Education Accreditation (CHEA) Database provides a full list of regional & national accreditations for every university in the country. Kentucky doesn’t have a huge problem with unaccredited schools, but here are a few institutions that have experienced quality issues in recent years. ANU is a for-profit institution with multiple campuses across the U.S. It is nationally accredited by the Accrediting Council for Independent Colleges and Schools (ACICS), but it is not regionally accredited. In August 2016, WKYT reported that National College of Kentucky, now operating as American National University Inc., was required to pay the state a combined $157,000 in civil monetary sanctions for refusing to respond to a subpoena during an investigation into potential violations of Kentucky’s Consumer Protection Act. College Scorecard reports that the Lexington campus has a low percentage of students who have started paying down their debt within three years of leaving school. Georgetown College is regionally accredited. However, SACSCOC placed the school on Probation in June 2016 for one year due to concerns with financial resources & stability. According to Kentucky Today, in 2014 the school was forced to cut 20% of its faculty and end four majors because of a $4 million deficit and declining enrollment. On the other hand, College Scorecard reports the school has stable student statistics. Kentucky Wesleyan College is regionally accredited by SACSCOC. However, it was placed on Probation in June 2016 for six months due to concerns with financial resources & stability. In 2015, KWC appeared on a U.S. Department of Education list of institutions subject to financial restrictions known as heightened cash monitoring. On the other hand, College Scorecard reports the school has stable student statistics. St. Catharine College is regionally accredited by SACSCOC. However, in June 2016 its status was continued on Warning by SACSCOC after review of a First Monitoring Report and financial statements. Warning is not as serious as Probation, but SACSCOC has concerns about financial resources & stability. This status is re-considered in December 2016. University of Phoenix is a for-profit institution headquartered in Arizona. The CHEA Database notes that it is regionally accredited by the Higher Learning Commission (HLC), but it has been subject to a number of lawsuits over the years. College Scorecard reports that the Louisville campus has a low graduation rate. Southern Association of Colleges and Schools Commission on Colleges (SACSCOC): Also known as SACS, this is the regional accrediting body for degree-granting higher education institutions in southern states, including Kentucky. Use the homepage to search for accredited institutions by state. Kentucky Virtual Campus for K-12 Students (KYVC4K12): Use this website to search for online high school courses offered by three public Kentucky providers: BAVEL, Jefferson County e-school, and KET. These providers only offer online courses to students in middle grades and high school—if you’re an adult learner, talk to your nearest County Adult Education Center. KnowHow2Transfer: A partner website to KnowHow2GoKY, KnowHow2Transfer is designed to help folks who want to transfer to four-year universities. Tools include a Course Equivalency Guide, a Transfer Planning Guide, and a way to explore degree pathways (e.g. degree completion programs). Kentucky Community and Technical College System (KCTCS) Online: Search for Learn on Demand and Learn by Term online programs offered by Kentucky’s community & technical colleges. Kentucky Virtual Campus (KYVC) Online Degrees & Courses: Search for distance learning programs at available at any KYVC institution. These include Kentucky community & technical colleges, public universities, and private schools (e.g. Spalding University). Southern Regional Education Board (SREB) Electronic Campus: Search for online degree programs or courses being offered by participating Kentucky institutions in the SREB campus.